i’ve been looking forward to today/tomorrow for over a month now. but first, i must blog about someone who is agak penting. jit is an awesome person, so well-mannered and best of all, witty! he is also the nicest guy i know, and is always ready to ferry me around anywhere. seriously, anywhere. and anytime i want, too. also, he trusts me with his coins. and no, that is not a euphemism for anything. i literally mean coins – ten cents, fifty cents. OH, and he didn’t let me wait alone for chin hong to arrive today. thanks jit. i mean, grandmaster jit. so, today was the manchester united training session at bukit jalil stadium. hong and i got there around two-ish, and managed to get pretty decent seats. except, we got kicked out of those because we weren’t vip holders, but then we found higher seats, that had a better vantage point and more air flow. it was so bloody humid, so air flow was muchly appreciated. and so we waited. and waited. and waited. every time i was convinced an hour had passed at the very least, i would glance at my phone and see that it had only been ten minutes. waiting around is so tiring. which was why i was so excited when the malaysian team walked out, each attached to a little kid. to be honest, i didn’t even know we’d be watching them train as well. and the haze doesn’t help either. i thought the crowd was unduly harsh on the malaysian team. we all know that malaysia is not on the same playing field as man u, so give them a break already. they’re trying. and maybe us malaysians should do the same. tearing something down is not the way to build it up. half the fun of football? being stuck amid a plethora of critics – mostly guys – all of whom obviously know how to play better than any other player on the field. i rolled my eyes so often, they hurt. so glad hong isn’t stupid like that. the malaysian team then left to the sounds of rousing cheers, and once again, we were back to waiting. it was pretty easy to figure out which entrance the man u players were coming out from, because they had the oh so subtle fru officers lining the entrance. at one point, one side of the stadium erupted in cheers, and we all excitedly looked over…only to see two red clad caucasians walk out. with video cameras. me: are they cheering for the media? hong: malaysia what. what do you expect? the man u players were a real class of the own, very gracious to the audience, probably also really freaked out by the screams their stretching prompted. i woul comment on their footie skills, but really, what do i know about that? i do know that watching them was fun. i didn’t get a good picture of him (because i was too busy oogling) but he was as aesthetically pleasing as i remember him being. he was my first football crush. i was 12, i think and i saw him in the papers, and that was it really. i’ve had many football crushes since, but you kow what they say, you never forget your first crush. 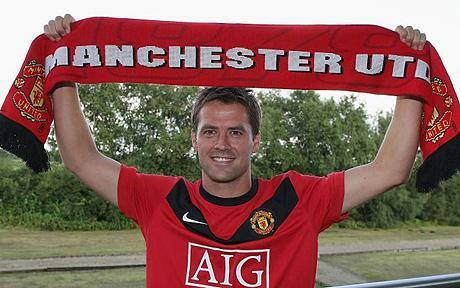 so excited that he’s at man u now. so excited about the game tomorrow. it’s nice to be excited about things again. you pick the one where my hand is up kung-fu-talented-red-panda-derriere…. yeah! i’m excited for it too. hoping that owen will be making waves.